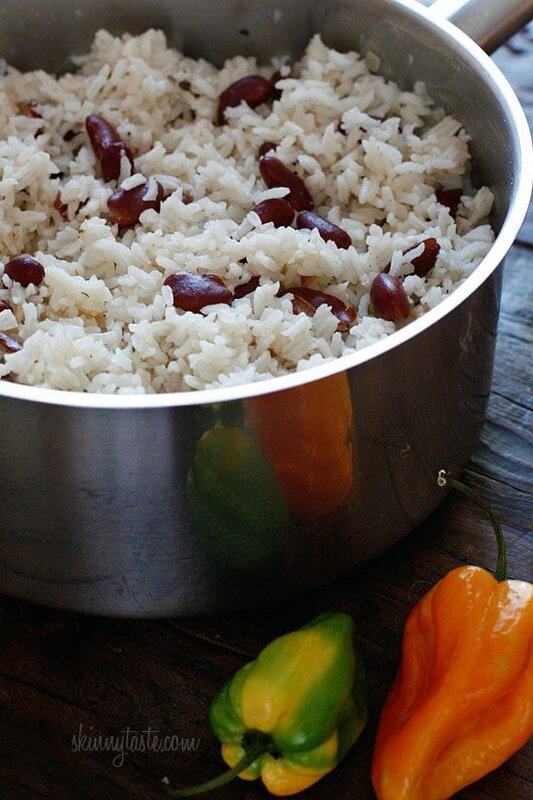 Coconut milk, thyme, scallions and scotch bonnet peppers give this Jamaican red beans and rice dish an island flair! The perfect side dish to Jamaican Brown Stew Chicken, or enjoy this as a meatless main dish with a simple avocado and tomato salad on the side. Vegetarian, vegan and gluten-free! 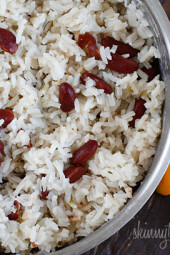 Rice and beans are a staple in most Latin and Caribbean countries because they are inexpensive and nutritious. Beans are an excellent source of fiber, protein and complex carbohydrates. The rice is not spicy since the pepper is cooked whole for added flavor and is discarded before it’s finished. Of course, if you want a spicy rice dish, you could chop the scotch bonnet and add it to the rice, but be warned, it will be hot! You can easily make half the recipe for less servings, but sometimes using a half a can of coconut milk could be such a waste, so I find it easier to make more and save the rest for leftovers. In a medium heavy saucepan, heat oil over medium heat; add garlic, scallion, onion and thyme. Sauté a few minutes, then add rice, beans and stir. Add the coconut milk, water, salt and fresh pepper and place the whole scotch bonnet pepper in the pot, stir to combine and bring to a boil. Remove from heat and keep covered for 10 additional minutes to allow the steam to finish cooking the rice (do not be tempted to lift the lid before that). Hi, The nutritional info is not for this recipe. It lists avocado and tuna (maybe it’s just the serving size into that’s incorrect?). 😉 Your recipes are great by the way! I’ve lost 30 lbs on WW with mostly your recipes as help! Thank you! Nutritional info incorrect it mentions tuna and avocado. Neither is in this recipe. Oh I’m just seeing you corrected this 2 days ago…but we still see it. I make it better than you! No canola oil! You are arrogant if you think otherwise! I know all of your thoughts! My parents are Jamaican so I was raised eating Jamaican food including rice and peas. I made this tonight and I can say that this recipe is authentic. Even though the preparation is slightly different from the way my mom makes it (she doesn’t sauté the onions, garlic, scallion & thyme) the ingredients are essentially the same. It was very flavorful and so good I had to stop myself from getting another serving! The only thing I’ll change next time is to use a little less water because I like my rice to be soft. But that’s just my own personal preference. As a side note, I want to say thank you Gina for your wonderful recipes. Everything I have made on your site has been delicious and even my picky eating children have liked what I’ve made. You have restored my faith in my ability to cook and I really appreciate that!! Thank you! Do happy you enjoyed it! I had to add an additional teaspoon of oil. Even with my burner on low, it was not enough to stop the onions from browning very quickly. though I used dry thyme and maybe it was the moisture in the fresh thyme that allows for only 1 t. of oil. Thank you. I have been promising myself o find a red beans and rice recipe. This one looks healthy to boot!. Love the comments guys, with suggestions and mods! I made this on Sunday for our Caribbean night meal. The only change I made was to use Chicken Broth instead of water. It may not be traditional but it was very good! I'll be making this one again. Thanks for the lightened up version of one of my favorite rice dishes. I have done my own experimentation with the same ingredients, yet I'm one of those cooks who never writes down what I do. This is why we have blogs like yours. I'm not a fan of coconut (like eating sunscreen) … does the flavour come through very strong? I think I need to get over the whole sunscreen thing but want to take baby steps! I followed the recipe but used the brown rice and added 1/2 cup as per Gina's suggestion in the comment. It was way too much liquid and would not dry out. I suggest not adding the 1/2 cup and cook as the recipe suggests. I also used instant brown rice. Very good! Not authentic like the others have suggested but still a great alternative for us island folks who want to eat a healthier version. After reading the comments and looking up similar recipes, I made the following adjustments and it came out delish! Thanks for this – your verison sounds even better! I really can't believe how delicious this is! I am so glad that I finally started liking beans. If my mom knew, she would kill me for all the grief I gave her as a kid! LOL Thanks so much for sharing! I make it with brown rice all the time, using basically this same recipe, minus the onion and garlic. I use a rice cooker and it comes out perfect every time. In fact, you really can't tell it's brown rice, it tastes completely authentic. I also add a few whole allspice berries and cook dried peas and add a few spoonfuls in addition to some of the boiling water to give the rice that pinkish color. this rice was so good! For the coconut milk, should it be unsweetened like what is called for in the Jamaican chicken recipe? Gina, I love your recipes! 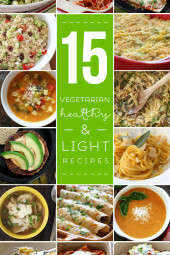 I am a vegetarian and a Registered Dietitian, and I'm enjoying making tons of your recipes. I made this dish last night, but I chopped up 2 scotch bonnet peppers and 1 jalapeño and added scotch bonnet pepper hot sauce to it. We love spicy! I also used brown rice, but sadly the rice didn't turn out great, so I will have to play around w/ the recipe some more. The flavors in this dish were great. We visited Jamaica 2 years ago and can't wait to go back. Thank you for your amazing recipes! I actually made this recipe this week and I have to say it was very easy. To top it off it was DELICIOUS! !By the third day it was DIVINE! 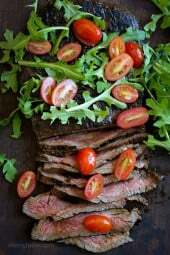 I love this site and have made other dishes and I’m always amazed that something that is healthy can taste sooo good! It’s helping stick to my Weight Watcher Plan!! My husband loved this rice!!! Thank you thank you thank you! I'm Jamaican and I haven't had a Jamaican meal since joining Weight Watcher. Your healthy version of rice and peas and brown stew chicken made my day. Should the light coconut milk be sweetened or unsweetened? Hi Gina! I cooked this up tonight and I included Cilantro and lime juice …. Yum!!! Hi there! Thanks for your awesome recipes! I have a question for you though- is there a way to print your recipes without all of the pics, pictures, etc? More like a traditional recipe print out? I love the pics and comments but really want a shorter form for my cookbook. Thanks! At the bottom of the recipe is a box to print recipe. I never get all the pictures and comments. You many need to click a button to turn them off. If you don't care for killer hot food, you may want to use a jalapeno instead. Habanero and Scotch Bonnet are some of the hottest peppers in the world!! If you drop it in whole and do not puncture the pepper, the dish may not be killer hot; I'm not sure as I steer clear of these 2. I sell peppers for a living and have a good tolerance for chiles, but those are off my list. If you cut it open, be sure to wash your hands including under your finger nails, cutting board and knife thoroughly before touching eyes and other tender tissues. I actually have a box of disposable surgical gloves for use with chilies and raw chicken. That's a tip from a chef I work with. I'm not trying to scare the heck out of anyone. Just a warning for those who love Skinnytaste and may not be familiar with this type of chile. So tru my sista. Mi rice n peas neva look so white, but more reddish like dem peas colour. Thanks Gina – this looks delicious. For those who want to make half a batch, coconut milk freezes well in a small ziplock bag or plastic container. I found the peppers in a nearby market that sells Latin and carribean food but you can use a habañero OR Serrano chilies (use twice as many) OR jalapeno peppers (use twice as many). Arlene, thanks for sharing your version. So glad you enjoyed this Amy!! I love your recipes, you keep us eating less processed foods. They are delicious. I made this and the chicken tonight and they were to die for I didnt have any of the peppers you had but used jalepeno's and the stew was hot just the way I like it. Thank you!!! 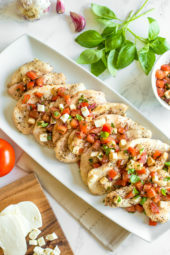 Your recipes stand apart from other WW or low cal ones because they have flavor. Thank you so much, Gina! 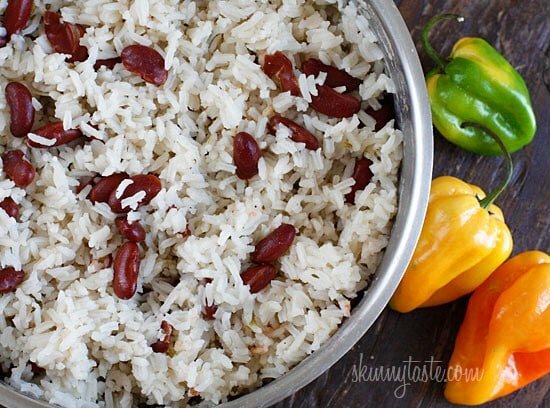 I'm Jamaican, and have been looking for a healthier way to cook cuisines from my country! It looks delicious. I'll definitely let you know how both recipes (this and the Brown Stew Chicken) taste. Thanks again. Your website is wonderful! I love red beans and rice! It was my favorite dish when I would travel to Jamaica for mission trips! Thanks so much for sharing! I just actually got back from Jamaica about a week ago. They called it Rice and Peas when we were there and this was pretty much the same dish. The chef at the resort we stayed at said they added coconut milk to pretty much every dish too. Gina what pepper do you think would be a good substitute for scotch bonnets? I've never seen that particular pepper in any store near me. 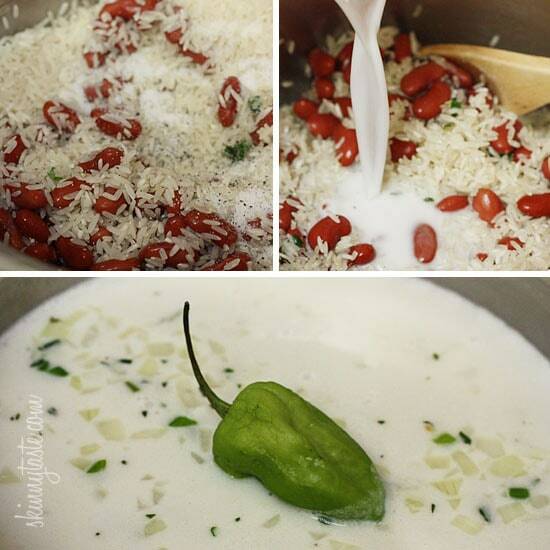 To make this with brown rice you will have to add more water, about 1/2 cup more and simmer it longer. Delish. I do enjoy fresh beans myself as well. Would brown rice work in this recipe as well? Sounds easy & yummy! We used to have it made for us while in Jamaica & I loved it so I will definitely need to try this soon! I'll be cutting up that pepper & keeping it in there, love spicy!